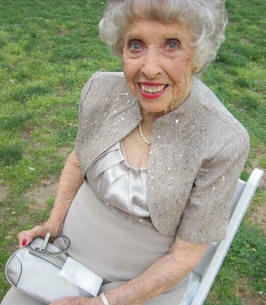 Mary Ruth Dickson Watkins Mann transcended from her earthly body to her heavenly one in the early morning hours on Monday, October, 22nd, 2018 at the age of 97 years, 4 months, and 2 days. Mary was survived by 3 daughters, Diane Miles (Ken) of Mobile, AL; Vickie Tuller Bond (Charlie) Rogers, AR; Kathy Mann Ritter (Grady) of Stilwell, OK; 12 Grandchildren and 21 Great Grandchildren. She is preceeded in death by her parents Otha Winfield and Carrie LeCroy Dickson; her spouses Roland Paul Watkins and Joseph Wilson Mann; brothers Herbert, Hubert, and Stanley Dickson, sisters Marie Johnson and Elsie Sewell. Mary was born on June 20th, 1921 in Waldo, AR. She taught Sunday school at Fairview United Methodist Church (FUMC) for 25 years. She and her husband, Paul, were Youth Directors for several years at FUMC, as well. She was a Girl Scout leader and President of the United Methodist Women. She was an avid Fairview Cardinal Fan!! Mary was a storyteller, cook, caregiver, and a master of bottle rocket wars She was unique in the fact that she loved everyone and treated everyone like family. She always made you feel at home. She was a devout Christian and practical jokester. She lived for a prank and ended each day with a prayer. The graveside service is scheduled for November 17th, 2018 at 11:30 a.m. in Waldo, AR at Shiloh Cemetery. The service will be officiated by Bro. David Watkins. All are welcome to attend graveside and a pot luck gathering will follow at Shiloh Fellowship Hall to celebrate Mary. In lieu of flowers please send donations to White Hall United Methodist Church, White Hall, AR and Fairview United Methodist Church, Camden, AR. To send flowers to the family of Mary Watkins Mann, please visit our Heartfelt Sympathies Store. My "Gram" was the happiest funniest silliest kindest most caring and inspirational person I have ever known and the only grandparent I had the privilege to get to know. I am sure she is in heaven watching over us now, but the grief I feel at her passing is hard to put into words. She was always there for me growing up and I know her always sunny outlook on life was passed on to me. When I was little Gram used to call me her "Sweet Angel" (only because my name is Ruth "Angela") which made me feel very special. I never liked being called Ruth, but I always loved the fact that my parents named me after both of my grandmothers (Mary Ruth and Ruth Miles). Now that I am older, I cherish the fact that I am named after someone who had such a profound impact on my life. I am so thankful for my time with her and only wish I had more of it. Gram you mean the world to me, all my love, RIP. I was saddened to hear of your mom’s passing.